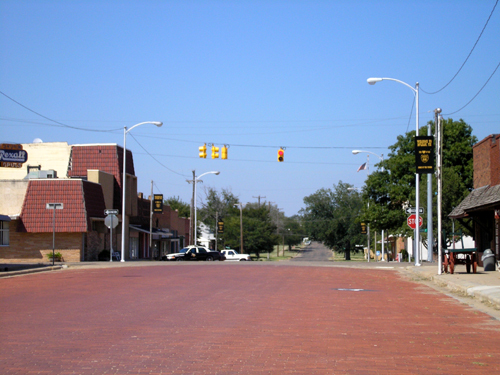 McLean, Texas, part of our appraiser territory, the second largest town in Gray county is of some historical note, as it was in 1901 that the Choctaw, Oklahoma Railroad dug a water well and built a switch house in this area. Later in 1901, it was Alfred Rowe an area rancher that laid out the town site, and named it after a Texas legislator and railroad commissioner William P. McLean. The town’s post office was established in 1902. By 1904 McLean had three stores, a bank, livery stables, a lumberyard and a news office. The town expanded during the oil boom of the 20’s and became an important shipping point for cattle. But larger urban areas began to draw the population in the 1960s and 1970s, leaving McLean with a small population of about 830 by 2000. Now, McLean seems to have an appeal for those wanting to get away from the big city life. The median age of McLean residents is about 40 and the estimated household income is about $29,725. Sitting just 35 miles from Pampa and 75 miles from Amarillo, allows residents to have that quiet country privacy, but the close availability of urban attractions and interesting activities. Residents in this area enjoy sports activities like fishing and hunting, but on special occasions can head into town for fine dining and other activities. Visitors to Amarillo enjoy the Amarillo Art Center, the Civic Center, The Little Theater, Zoo, The Cadillac Ranch and the Don Harrington Discovery Center. On the other hand, Pampa also offers more than a few attractions with the fun Mr. Ds amusement center, The White Deer Land Museum, and the Pampa annual Rodeo. Although, this is a small community, for some a little far out of the way, according to Real Estate Appraisals, homes in McLean are well below the average Texas home value of 125,000. In McLean you can still find an average home for a low starting price of $36,290 which is well below the real estate market value of most cities. On average, according to local real estate info, most homes in this small town sit at around $48,000, and those that are attached units have average prices of about $44,000. McLean is located in rural Texas, where families have community ties that often go back further than a generation or two. Although, the community has never been known as affluent, neither has it been overly affected by the financial crisis of a few years ago. Home prices have remained stable, and this results in very few, if any foreclosure properties. However, this doesn’t mean low priced properties are not available, people move away, and homes are left. So, if you are looking for low-priced investment properties there are usually plenty of viable options available in McLean.